Although, as I said abobe, Twitter officially doesn’t allow you to update your status via Google Talk, but we have many other ways to do this too. I once introduced identi.ca, which is a same micro-blogging service like Twitter, if you have a identi.ca account, your status posted can be easily synced to your Twitter account. That is to say, you updated your status on identi.ca via Google Talk (identi.ca supports IM), this status will be posted on Twitter too. Another unofficial IM bot for Twitter is Excla.im, it’s a very easy to use, no registeration required, just log in with your currently Google Account, just say, your Gmail account, after logging in, just input your twitter username and password and your Google Talk account Email, after that, add tweet@excla.im as your Gtalk contact, when you send a message to tweet@excla.im, this message will be automatically posted to Twitter. 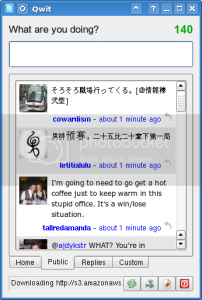 Another good news is that, we have a new Twitter client for your KDE desktop now, it’s called Qwit. Qwit is a simple Qt4 based client for Twitter. This project started with the purpose of studying Qt4 programming. It could be useful, for example, for KDE users, who need a native looking client for their systems.